Shrinathji Temple is a Hindu temple dedicated to Shrinathji in Nathdwara. It is considered an important pilgrimage centre by Vaishnavs. Shrinathji temple of Nathdwara, Rajasthan is located on the banks of the river Banas, at a distance of 48 km from the beautiful city of Udaipur. The glorious temple is a famous pilgrimage point of Rajasthan and a must-see if you are on tour of the religious places of Rajasthan. The Shrinathji temple of Nathdwara is famous for the Shringar of the deity where the idol is dressed in a new dress every day. Devotees come from all over the world come to see the idol's different forms. Nathdwara town is also famous as the Apollo of Mewar. 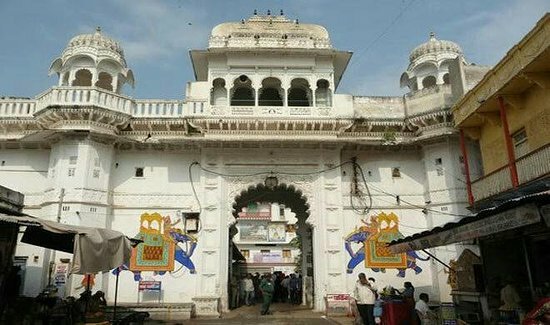 In the town of Nathdwara, Shrinathji temple is the centre of attraction, but the town is also famous for its 'pichhwai' paintings, ivory articles and mouth-watering sweets. There is no entry fee asked to enter the temple.